On your wedding day, it’s the little things — getting ready with your mom, walking with her down the aisle, or sharing a memorable dance — that turn an ordinary wedding into an unforgettable experience. Here are our favorite mother-daughter photos! This southern mama and her daughter share a special moment after putting on the veil. Nothing but smiles in the bridal suite. This bride’s young daughter looks in amazement at her pretty wedding hairstyle. An angelic bride leaves her mom awestruck. Concerned that your dress won’t fit? Don’t worry, Mom is a wonder with a zipper. This bride’s mother had some fun with her outfit choice and chose a bold red blazer and black feathered hat. The only thing better than wearing your mom’s earrings on your special day is capturing a photo of her putting them on you. A sweet moment between a bride and her little girl. An ecstatic mother and daughter literally jump for joy that the big day has finally arrived! This mother and father couldn’t be happier to see their little girl marry the man of her dreams. The sheer excitement on this bride’s face is priceless. A mother getting choked up at the sight of her beautiful daughter. We love how mom's vibrant dress is perfectly coordinated with the color scheme of the wedding. A mother and daughter put their heads together to create an adorable photo. Don’t be afraid to cry — emotional moments make the best pictures! We can’t help but smile when looking at this photo. A must-have photo showcasing both of your engagement rings. Such an adorable family portrait! Part of bride Jackie’s touching vows were dedicated to her new stepdaughter. She said, “I promise to be an example to Sarah and our family of what a good wife, friend, mother and woman should be.” How sweet! The raw emotion in this photo brings tears to our eyes. A unity sand ceremony including your kids is a fantastic way to represent the blending together of two families. 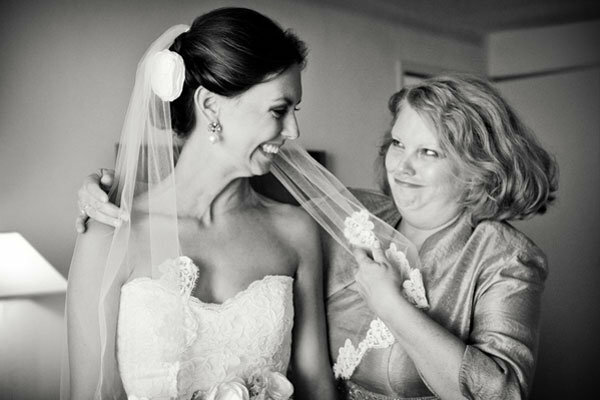 This touching photo would convince any bride to share the “first look” with her mother. Capture the last few moments of motherly advice on the way to the ceremony. No grass stains on Mama’s watch! A dreamy beach backdrop makes for a beautiful mother daughter photo. A moment of quiet prayer between a mother and daughter. This mother-daughter duo flash the same subtle but glowing smile. The bride's mom walked her down the aisle as Van Morrison’s “Brown Eyed Girl" played. This mother gazes adoringly at her stunning daughter. Everything about this rustic-chic wedding screams family, from the two open doors in the aisle to the bride having both her parents give her away. This mother-of-the-bride couldn’t be happier to be walking her daughter down the aisle. Mother and daughter stroll hand-in-hand to the ceremony. Add a unique touch and give mom a miniature version of your bouquet! A sweet kiss on the forehead before walking down the aisle. A kiss for the blushing bride that’s doubly sweet! A bride plants a big smooch on her elated mother’s cheek. This mother can’t hold back the tears as she embraces her daughter. This MOB is squeezing her daughter so tight, it looks like she never wants to let go. Eskimo kisses in the bridal suite equal a picture-perfect moment. The bride's mother beams with pride that her daughter decided to share her cultural traditions with her guests. Borrow this Hindu tradition and give your mom and dad seats of honor. A hysterical photo of a mom being hoisted in the air during the Hora. A radiant bride looks on as her new husband shares a dance with her lovable grandmother. Say a special thank you to mom by gushing about how amazing she is in front of all of your guests. And instead of tossing your bouquet, give it to the most important woman in your life. Sewn into bride Vanessa’s dress was a piece of her mother’s wedding dress, hand stitched with Vanessa and Andrew’s names and wedding date. Mom grins from ear-to-ear as the bride concentrates on making her corsage look perfect. This adorable couple shared one last kiss with their moms before walking down the aisle as husband and wife. Pure joy is radiating from this mother-daughter duo as they take a spin around the dance floor.